I know it may seem strange that over the past few weeks or months that I’ve been blabbering on about Game of Thrones and preferred characters from that series – especially right after a post about being faithful to my fictional husband. But, fear not. I’ve not turned my back on Johnny, far from it. I don’t know if I have mentioned the local bowling alley where I live? Probably – don’t worry this is related. I went last night with a couple of friends after a trip to the cinema was a complete bust. (The movie we wanted to see had a broken screen and there was nothing else on that appealed at a good time) So we just popped into the bowling alley instead for a game of air-hockey, pool and some random games. 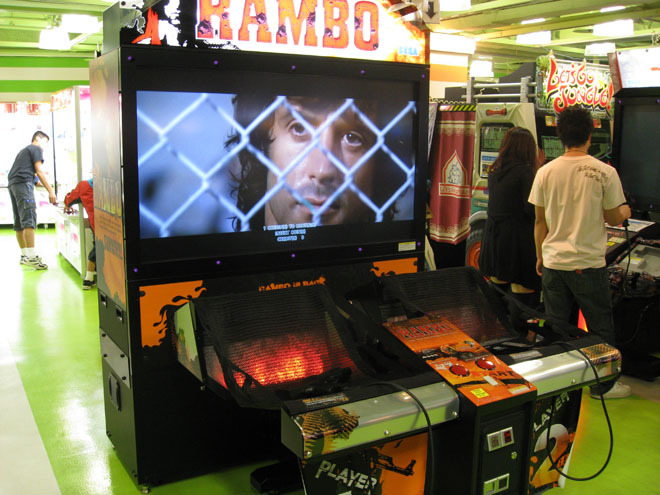 In the cinema there is a Rambo game – which I usually play on, but as I was with company I didn’t – However I did stop with one of my friends and had a really quick discussion about Rambo and they stated that they like the films. To which I replied “I really like the Rambo films.” The moment that I looked at the screen I saw Johhny-boy smiling (if you can really call it that) at me. I think today while I do some drawings I’ll have the films on as a comfort. I could do with it lately – and I have a lot of art to get done today, so it might be a bit of a marathon for me to enjoy! I was actually rather sad to hear that Rambo: The Video Game (Not the one above) – http://steamcommunity.com/app/274130 Was such a bust. I’ll throw it on my wish list and hope it comes up in the sale sometime as I’d clearly like to play it, but at the moment I don’t have £30 to throw away! Not even for Rambo, sorry hunny. Previous Previous post: It’s win or lose. Next Next post: International what day now!? Kindly let me recognize so that I may just subscribe. Thanks.